There are two facets of pool closing. Water chemistry and the “stuff you need to do”. Water chemistry is similar in any type of pool- in ground or above ground. Due to winter water temperatures the water balance needed for winter is different from what you need to have “in season”. The simple thing to do is to bring us a water sample from your pool. We will test the water and our computer will write a “prescription” for what your pool water needs. Our trained staff will provide you with the appropriate water balancers and the winter closing chemicals you need. “Stuff you need to do” After you have applied your chemicals, assuming you are going to shut your pool down, during the off season, your two objectives are to cover the pool and to protect the pool plumbing and equipment from freezing. In ground pools-Preparing your equipment. If your equipment is above your pool things are pretty easy. Look at your pool setup and determine what is at risk of freezing. Now, we need to take steps to prevent that freezing. Normally we will lower the water level in the pool to a point a few inches below the skimmer. Be sure your equipment is turned off (at the breaker, not just the timer). I f you are going to blow the water out of the return lines then remove the directional flow fittings (eyeballs) from the pool returns. Blow the water out of those lines and plug them while the air is going through them. Then blow the water out of the skimmer lines and screw the expansion plug into the port in the bottom of the skimmer. Next we will remove the drain plug(s) from the pumps and filter. Normally there are two plugs on the main pool pump, one plug on the cleaner booster pump and one on the filter. If you have a chlorinator you need to drain it as well-either by removing a plug or taking the cap off and inverting it. Do not leave chlorine in a chlorinator over the off season. It will cause major damage to your equipment. Removing the plugs will allow the water to drain from the equipment to prevent freezing. If you have loops of pipe (above ground) or equipment below water level or anything that you cannot drain these may need to inject swimming pool antifreeze into these area. This may require specialized equipment. We can send a technician to help. Install your cover. You will probably want to remove ladders and handrails prior to putting the cover on. 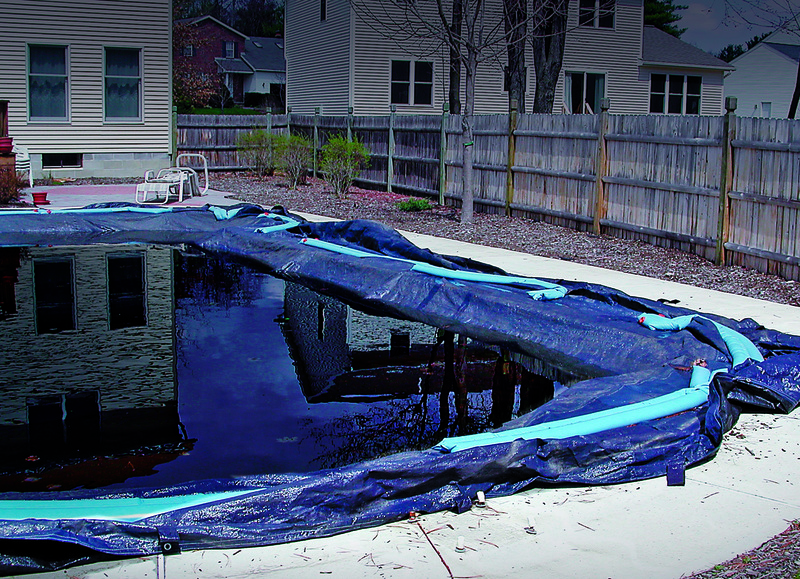 If using a tarp type cover be sure to install the cover so that it “drapes” down the pool walls and onto the surface of the water. We recommend using commercially available water tubes or water filled weights to anchor the cover edges. Anchoring the cover with ropes will lead to the cover being stressed and torn when rainwater accumulates on it. Using hard objects will lead to pool damage if they are pulled into the pool by the weight of water on the cover. Be sure to keep the water, leaves and debris off the cover through the off season. With this type cover you must secure the pool area as these covers can pose an extreme hazard for a person or pet getting onto the cover. With properly installed safety covers this is certainly less of an issue. If you have questions or if this job is beyond the scope or what you are comfortable doing please contact us. We will be glad to help. There’s a reason they’re called Safety covers. 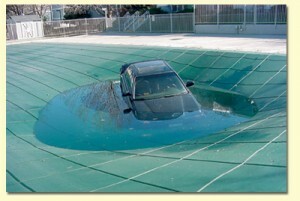 Over the last 22 years we have closed and covered countless pools as winter approached. 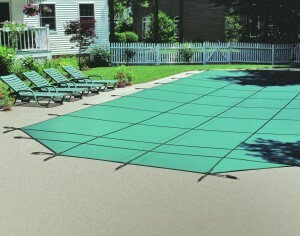 In the “early days” almost everyone used a tarp type cover and water tubes to cover their pools. These covers, although relatively inexpensive to purchase (initially), are a maintenance nightmare and as a parent (and now as a grandparent) they scare me to death. Every time I installed one of these covers I prayed that a child would not find their way onto that cover. Imagine a child or a beloved pet stepping onto what they thought was a solid surface and being plunged into 45 degree water with a tarp wrapping them up as they fall into the water. From an aesthetic standpoint no matter how neatly we install them they collect water and debris through the winter and look awful. Stories of homeowners and service companies dumping green water and rotten leaves into their pool at opening time are all too common. Fortunately, very substantial, easy to handle high density, high quality mesh safety covers are becoming more and more common. 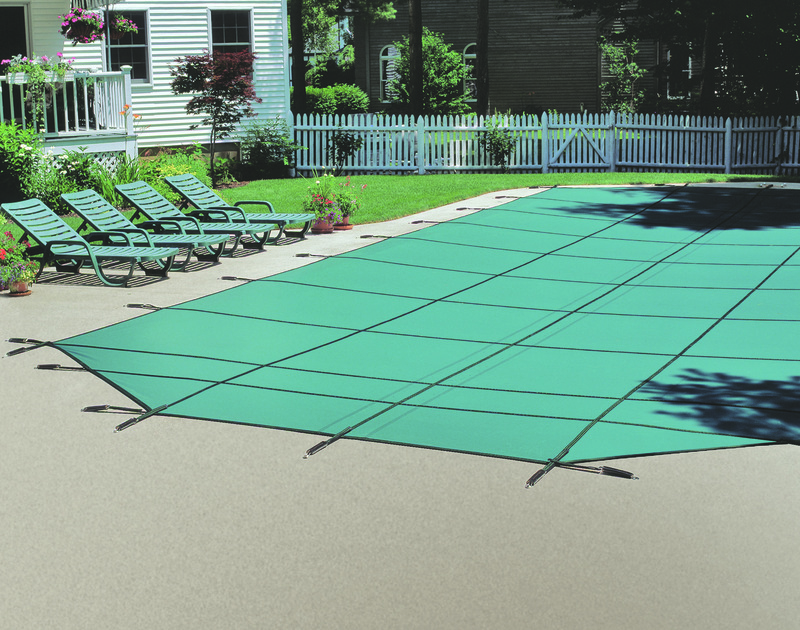 These covers are secured to the deck by retractable anchors, stretch tightly across the pool and, properly installed, make it almost impossible for a child or animal to fall into the pool. My dogs routinely walk on mine and I have seen children play on these covers (I don’t recommend this!). In my hometown a friend had a horse get on his pool. The horse’s hooves punched through but his body was supported by the cover. He was unharmed. 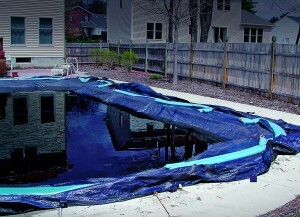 The pool and cover suffered a relatively small amount of damage. These covers look neat on the pool. Water goes though the cover so the surface stays dry. Leaves can easily be blown off the cover. You may want to upgrade to a quality safety cover. We are pleased to offer CoverStar safety covers. Quality construction, great service –made here in Georgia. Contact us for more information.